I was first introduced to our next contributor, “King of Horror” Andy G, through last year’s series. Since then, he and the other members of the Talking Terror podcast crew have become friends of ours (mine), as well as big supporters of Horror And Sons. I also have since become a regular (well, as “regular” as I can) listener of theirs, and try to support their work often. For his sophomore Halloween Horrors effort, “King” takes us back to 1978 for a look at his favorite Halloween movie. And he’s also taking us to the mall! Oh, man! I hope they have an Orange Julius! Or maybe that place that sells the giant cookies! Sorry, folks! This mall only has zombies… and the occasional biker gang… and probably a Hammond Organs. Can you feel it? That wonderful change that’s in the air. When the leaves begin to change color and scatter in bursts of red, yellow, and orange. It’s that time when nothing is better than that first sip of apple cider, and a visit to the local pumpkin patch is in order. That’s right, October has once again arrived and Halloween is well on its way. For me, nothing goes better with the month of October more than a classic horror film. With that said, I’ve decided to talk about my favorite film to watch around Halloween. That film is George A. Romero’s Dawn of the Dead, released in 1978. Ten years prior, Romero had released the classic hit Night of the Living Dead. It was a film that audiences were not at all prepared for. The ghouls in that film were no longer the mindless workers seen in movies featuring Bela Lugosi. Romero’s shambling zombies could be your neighbor, friend, or even a close loved one. They were back from the dead with an insatiable hunger for your flesh. While that film became a midnight drive-in classic, and has since become the defining film for the modern-day zombie, it was not a film that Romero considered having a follow-up to. George wanted to “move on”, to make other films and not just be considered a horror director, but the genre would continue to call upon him. To consider how Dawn of the Dead came to be, one would have to consider two individual moments that occurred for Romero. One event would be a visit to the Monroeville Mall, which at the time was one of the largest indoor malls in the country. The seed was planted when Romero began to wonder if this place could be a safe haven during a zombie apocalypse. The second would be a chance encounter with Italian horror director Dario Argento. 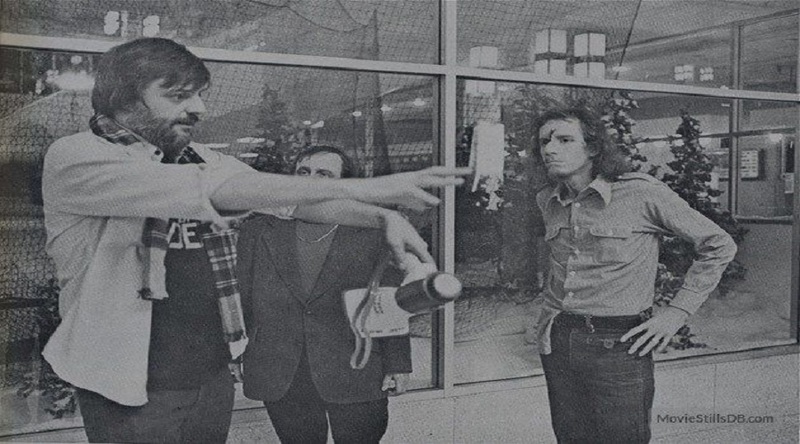 It was at the urging of Argento that Romero took up occupancy in a small apartment in Rome and wrote the script for what would become Dawn of the Dead. Argento would go on to release an extended version of the film entitled Zombie internationally, as well as hire the band Goblin to provide the soundtrack. It was this collaboration that would give life to the undead and the duo would team up once again a few years later for the Edgar Allan Poe inspired Two Evil Eyes, but that’s a story for another day my friends. The story is simple, yet effective. Four people who are escaping the zombie carnage happening in an unknown city in Pennsylvania via helicopter find themselves descending upon an indoor shopping mall. While there, they discover endless possibilities for survival with food, weapons, clothes and most importantly, shelter. What transpires is not only a fun ride through a mall, but fighting off zombies as well. Come on, who hasn’t fantasized at one point of having control over an entire mall? It also becomes a film that manages to reflect that getting too comfortable in one place for too long can have dire consequences. We must also bow down to the creativity of special make-up effects artist Tom Savini. In this day and age, practical effects have become less and less in modern horror films. It has become cheaper and easier to utilize CGI for gore and blood. Yet, back in the late 70’s, you had no choice but to get creative. A scene early on in the film featuring a head being blown off by a shotgun blast was just a taste of the gruesome scenes to come. These zombies were unraveling intestines and eagerly pulling off limbs to chomp on. Savini would go on to say that the 3M paint used for blood was too bright and the gray paint used for the zombies would look too blue on the film. To me that only adds to the magic of this film. It was one thing to have a great script by Romero, but the effects by Savini were what truly put this film into the next level. Aside from the endless waves of zombies, the film features a small cast. This can sometimes be a detriment to a film, horror or otherwise, but in the case of Dawn, it works to its betterment. Ken Foree as “Peter”, Scott Reiniger as “Roger”, David Emge as “Stephen” aka “Flyboy” and Gaylen Ross as “Francine”. Each character had their strengths and weaknesses while attempting to work together. Peter and Roger are SWAT officers and while Peter is the strong, leader type, Roger is quick to get excited and finds out that his impulsiveness would lead to his undoing. Stephen is a helicopter pilot for WGON-TV who wants to be more like Peter and Roger when it comes to running and gunning. Much like with Roger, Stephen would find that his impulsiveness to protect the mall that he believes belongs to them would lead to his demise. Francine, whom also works for WGON-TV as a producer, is a stronger character than I believe people are apt to give her credit for. She’s pregnant, but refuses to let that stop her. She wants to learn how to shoot and fly the helicopter in case anything happens to Stephen. While she may not be on the same level as a character like “Sarah Connor” or “Ellen Ripley”, I still feel Francine deserves credit for not backing down while the world crumbles around her. 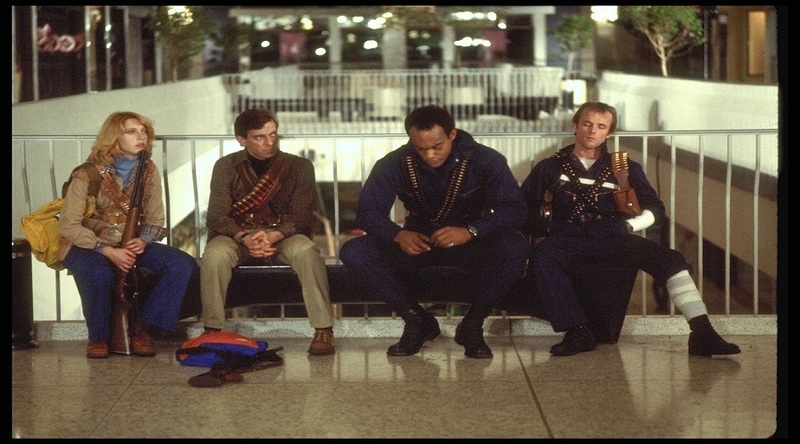 I will never forget my first introduction to Dawn of the Dead. It was just before Halloween in 1997. A friend lent me his VHS copy of the film since I told him I was such a fan of Night of the Living Dead. Pressing play and sitting back on my couch, I was transported back to the 1970’s where the indoor mall was a fancy place to be and a place I had taken for granted up until that point. 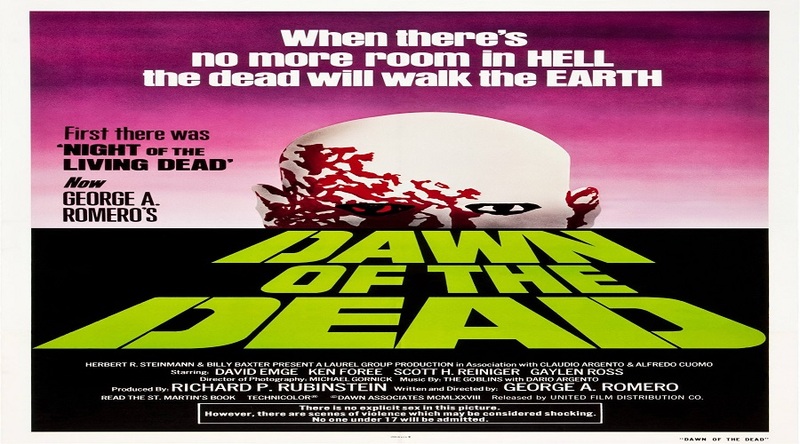 Since then, Dawn of the Dead has become my go-to film every October when Halloween draws near, while my Mother still calls me up and insists on borrowing my copy of Night of the Living Dead. For her, no Halloween is complete without a viewing of that film. George A. Romero passed away in 2017, but his legacy will always live on through his movies. He will always be my favorite director for various reasons. He was a blue-collar type of filmmaker. He worked with moderate budgets, but continued to create so many films that are still talked about today. 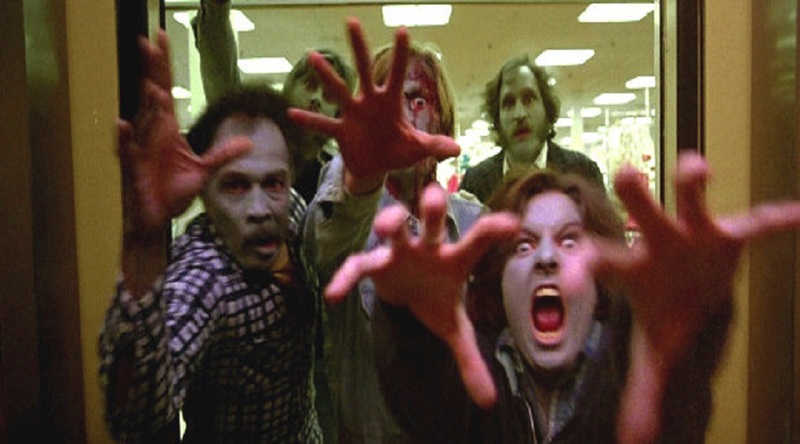 Dawn of the Dead was an example of not only his film style, but how to create a lasting movie while working on a small budget, small crew, and a cast of unknown actors. Come to think of it, Dawn was released in 1978 and it kind of reminds me of another horror film released the same year. Small budget with a small cast and crew, featuring a killer in a white mask murdering babysitters on Halloween night, but as I said earlier…. that’s a story for another time my friends….. Happy Halloween from your old pal the King of Horror Andy G and remember…. When there’s no more room in Hell, The dead will walk the mall!